All of us have experienced talking to that person next to us on flights – be it a small one or a long-haul one. And some of those conversations may have got personal or flirtatious. And for whatever reason you may have missed an opportunity to take down that person’s phone number. No need to regret because what might have been thanks to a new website called “We Met on a Plane” that can help passengers reconnect with each other. Brainchild of Will Scully-Power, a 31 year-old Australian Internet entrepreneur, who says he came up with the idea after meeting his own girlfriend on a plane in 2011, the encounter spurred him to start up the site, particularly when he later discovered there might be a market for the service. The site allows users to enter your flight number, year, month, date, destination and origin. The search results show up with any relevant stories from that flight and give you the chance to reply to the story and reconnect with that special someone, should you be lucky enough to spot them. If no relevant results pop up, you can also click “Share Your Story” and explain how you met. 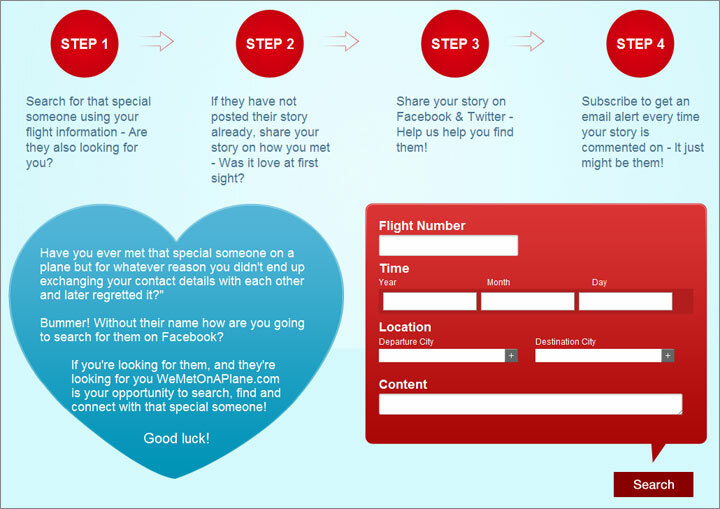 There’s also the option to share the story on Facebook and Twitter to increase your chances of making a connection. « CheapAir updates results to show flights with wi-fi, live TV, etc.